Two young Swanage sailors,Luke Yeates and Mark Angell,leave Poole Harbour on 3rd June to attempt a circumnavigation of mainland Britain on their 18ft Hobie Tiger catamaran. They hope to complete the marathon in 27 days. You can follow their progress on their website at www.britCAT.co.uk. a denture repair cost £75 just recently here in Swanage. 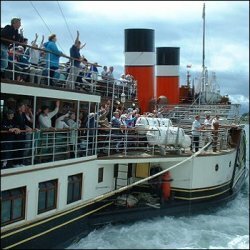 I am not aware of any official notification that the Balmoral and the Waverley will no longer be allowed to dock at Swanage Pier. However, I understand an accident involving the Balmoral there last Summer has led to a disagreement over insurance claims for the necessary repairs. The door to the Jurassic Coast from Swanage pier has been closed. Another blow to tourism, another step backwards, another opportunity squandered. It seems the problem is financial. Swanage Town Council or Purbeck District must see the need for financial support for proper maintenance or insurance cover; even if the Council accepts no responsibility or recognition of the pier’s value to tourism. Surely it is not beyond their means to get the Dolphin pier replaced or repaired? The argument over insurance can follow. Keep the boats coming sooner rather than later. Being a foodie! With a figure to match. A connoisseur of good food beautifully cooked and presented. What and where, are the best recommended restaurants in a radius of say- 20 miles? If nothing else, Swanage has had its fair share of Characters. Can anyone shed any light on Mt Streeter? Or come to that, any of the other eccentrics that brightened our lives here in Swanage? Carlo and Angelo Wiggins have been successful in their application for an alcohol license in the lower High Street. Conditions apply: No off sales after 11pm, CCTV to be installed, all looking under 21's to be I.D.'d. I am sure everyone wishes them every success in the new venture. At the Parish Assembly,Councillor Gary Suttle explained that after a review of all options, the existing number of huts would be maintained. Town Clerk said new licences would be going out soon. Councillor Colin Bright added that the council was arranging to provide new bases for all huts. funding apparently ceasing, no secretary, no reports published, function seems to support just a few projects. John Wootton asked what feedback was given to the community. Town Clerk (Alan Leeson) answered that funding was assured to keep this project going; considered an important government programme, part of the Countryside Agency and South West Regional Assembly. Councillor June Farrow noted the secretary's absence was temporary. Councillor MIke Pratt noted that other councils regarded Swanage's progress as an excellent model. Councillor Mike Hadley asked how anyone could say the Swanage Partnership was a good model if no report has ever been published, and reported that in response to a request he had made, minutes were now to be available at the Town Hall and the Library. 2/ Sand build up in bay. Mr Mole raised recent report by boat operator Roger Marsh of boats grounding near the old stone quay, suggesting this is caused by the recharge works. He said this could also lead to greater flooding in strong easterlies. He also noted the amount of sand blowing up Victoria Avenue. Councillor Gary Suttle said PDC engineers were investigating these issues now, and that the roads (and drains) would be cleared. 3/ Licensing, Lower High Street. Mr Owen raised issue of new 12.00am license application for snack bar in Lower High Street, concerned with excessive drinking in this area. Councillor Gary Suttle noted that new laws gave individuals greater powers than ever to have their objections/concerns addressed, and that all complaints/objections should be made to the licensing authority. 4/ Footpath/waymarking. Mr Mackenzie expressed gratitude (on behalf of the Ramblers' Association) for much improved footpath signage in and around Swanage. The Town Clerk said that this was in part owing to the efforts of the late Hilary O'Donovan, and was certainly council policy to continue. 5/ Pier jumping. Lorna Haines asked that signs could be put up to tell people that pier jumping was "at own risk". Mike Hadley suggested an area be provided where jumping could be allowed. Councillor June Farrow to take up with the Pier Company. 6/ Boat park. Questions asked why price rises so high, and could there be special (discounted) passes for residents whose boats have been displaced by refurbishment?Assistant Town Clerk (Martin) explained that (although he didn't have figures to hand) he didn't believe the increases were exceptional, that under Best Value the council had to try to maintain income so increase had to attempt to compensate for reduced spaces. Mike Hadley asked about proposal for barrier, and how this would work for people wanting to launch/retrieve their boats early/late. Town Clerk said barrier was deferred for the time being, though it was a balance between the need to provide security and access. 7/ Beach huts. Question asked if the possible reduction of the number of beach huts was resolved yet. Councillor Gary Suttle explained that after a review of all options, the existing number of huts would be maintained. Town Clerk said new licences would be going out soon. Councillor Colin Bright added that the council was arranging to provide new bases for all huts. If I've forgotten anything, please add it as a Comment. Swanage Residents Association -- AGM --- Public meeting for all interested in any issues to do with Swanage, Wednesday 17th May, 7.30 pm Catholic Hall, Rempstone Road. Non-members welcome. The Unfettered immigration of Foreigners into Britain. On another thread this subject has been responsible for some heated and conflicting views. Let us bring it out into the open. It is my considered opinion that this influx of peoples from foreign lands. (Any foreign land) should stop. Immediately. Those that come here illegally, should be returned post haste. Those that have settled here again illegally, no matter the period of time, should also be repatriated. Immediately. All criminals in our prisons should be deported, or stay in prison. Before any one starts yelling Racist! This is the policy of the two main political parties. SWANAGE has been declared the fourth best seaside resort in Britain,by Which? magazine.A mixture of laid-back atmosphere, dramatic scenery and Blue Flag beaches has earned Swanage its spot in the top 10. "Saucy postcards and penny slot machines evoke the past on the restored Victorian pier," the article continues. "And boat trips run to the soaring Old Harry Rocks or further afield to Bournemouth, Poole or Brownsea Island. The Durlston Country Park trails offer stunning views, as well as a chance to spot bottlenose dolphins." The top spot in the Which? poll went to Whitby in Yorkshire.